Crumb's Twas Ever Thus was originally created and published in 1969, on the back cover of Changes #3, a hippie magazine published in Oakland, California. Soon after, it became more popular when it was printed as a poster. In 2008 we printed this image, with some color revisions, as a signed serigraph edition. 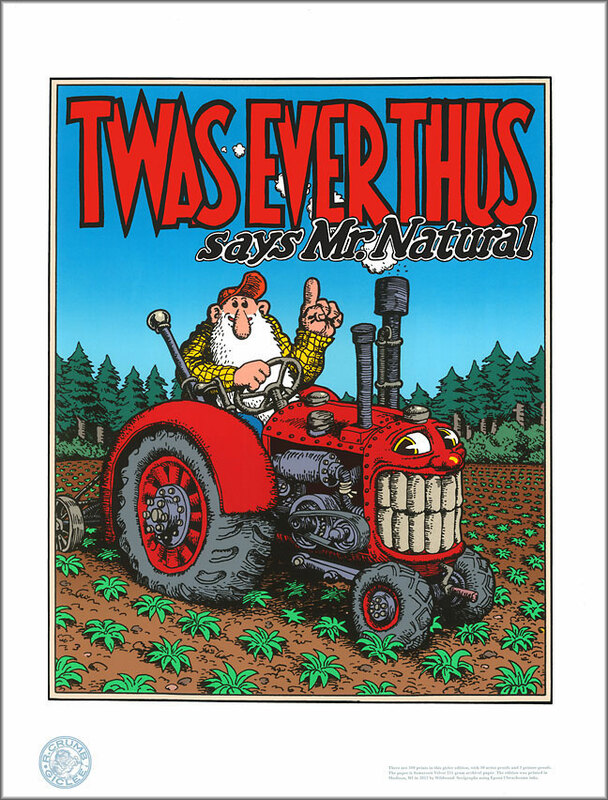 Now, based upon that sold-out serigraph edition, we're releasing a new giclee edition of Crumb's Twas Ever Thus. The image size is 15" x 18.5". The Somerset enhanced archival white paper is 18" x 24". The giclee prints are shipped in indestructible tubes. Every print from Wildwood Serigraphs comes with our unconditional guarantee for your complete satisfaction or your money back. Unsigned edition limited to 300 prints. Release date: August 28, 2012. Please check out the Official Crumb Site for Crumb on Others, the fourth part of a continuing series of discussions between Robert Crumb and Wildwood Serigraph's Alex Wood. In a discussion from August, 2012, Alex asks Robert for his opinions on artists, celebrities, and politicians including Woody Allen, the Marx Brothers, Abraham Lincoln and more.